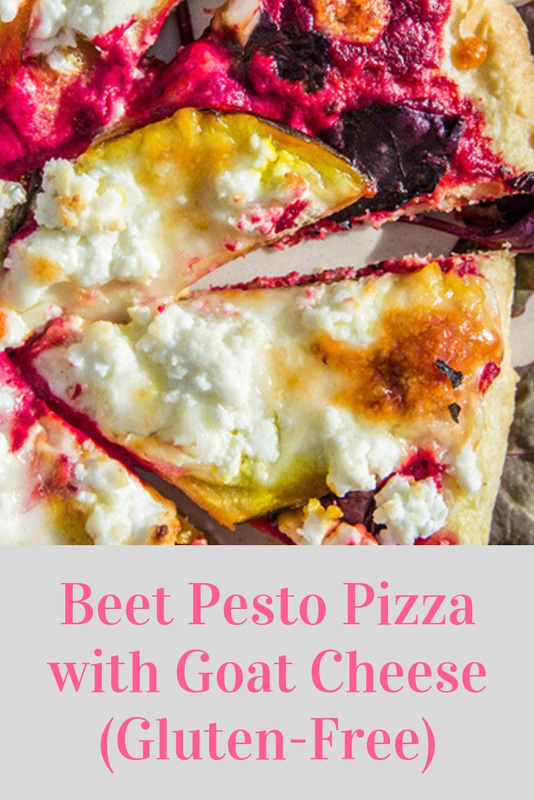 Enjoy a party in your mouth with every bite of this guilt and Gluten-Free Beet Pesto Pizza. I love it when my favorite ingredients collide into one fantastic, vibrant, and delicious meal (Thanks, mom, for finding and sharing this recipe with me). Yes - creating this tasty gluten-free pizza takes some time, but it is definitely worth the effort. Sip your favorite iced-tea or a glass of wine, listen to some soul-filled jazz, and enjoy the pizza-creating process because a little anticipation makes this meal even more amazing. Packed with antioxidants, beets are also high in Folate, Fiber, Magnesium, Potassium, Manganese, and Iron making this pizza a powerhouse of nutritional benefits. Thank you, beets. Although this pizza is not vegan, the recipe is definitely vegan friendly as there are many alternatives to using eggs and cheese. You may wish to use an egg substitute (3:1 water to Chia seeds) and/or cashew cheese. Creating a vegan pesto with Bragg's Nutritional Yeast and walnuts is also a nutritious option. Explore various toppings and share your experiences with me. I would love to hear from you. Lightly oil parchment paper with coconut oil and lay over a small pizza pan (about 8 1/2 inches or so). Put back in oven for 15-20 minutes, until your cheese begins to brown slightly. Remove from oven, let cool, and then slice and enjoy!